Are there times your voice is not heard? Is it because you do not speak up? Or are the other voices and sounds drowning you out? Do you ever want to be, maybe even need to be, invisible? When I was newly widowed, there were many times I felt invisible. I didn’t fit into any group. I was no longer married, but wasn’t quite single, either. My friends were still in the married group. I moved from “part of the group” to “third wheel” status in the blink of an eye. I didn’t know how to be seen. Others seemed to look through me, not ever seeing the ME that stood there. I didn’t know how to be seen, because I didn’t know how to see myself. I watched as others buzzed around and wondered how I could be so lonely in a such a busy group of people. I didn’t know how speak up, it was easier to fade away than to endure the pain of living in the world in which I no longer belonged. One can be invisible for lots of reasons. When another’s need to be recognized is louder and more aggressive than your own, their need pushes all others out-of-the-way. I feel the shutters begin to close in around me. My opinion doesn’t matter. My voice in not important. Even the facts and information that I know are dismissed and discounted if they are not in agreement. I am forced to disappear within myself to avoid further conflict. It is often that very need to avoid conflict that pushes me further onto the sidelines. When I am helpless to change anything, when I’m caught on the carousel of life and there’s no way to regain control, I disappear. There are times when I try to blend into the background. There are other times when I need desperately to be heard, to be seen. But, I’m invisible. It’s as if I’m speaking in an unknown language or wearing the cloak of invisibility. No one is listening. No one sees me. Regardless of how hard I try, I cannot break through. I begin to believe that I’m truly invisible, that I truly do not matter. And, that is the real problem. I accept the invisibility. I stop trying. I fade away. We need to be aware of those invisible people that surround us. The invisible person may be that homeless person that has become a part of the background. The invisible person may be the senior citizen that tells the same stories over and over and over again. The invisible person may be the widow that reminds you how fragile life is. The invisible person may be a friend or family member that refuses to see things your way causing you to rethink your own ideas or decisions. Invisible people surround us. They work in the deli’s in our offices. They stand on the street corners. They are our neighbors, our friends, our family. We need to put on our “X-ray vision” and find those invisible people. We need to see them. Listen to them. We need to care. I am in a second marriage. I was widowed in 2005. In 2015, I married my dearest friend who had been divorced for a few years. He was also a good friend to my late husband. We now have a blended family with five kids: the oldest is 28 and the youngest is 18. They’ve know each other through the years as they grew up in church together. Marriage the 2nd time around is familiar and different all at the same time. I married Terry in 1987. We were in our late 20’s. We thought we knew everything. We did everything together, even grocery shopping. Having lived on my own for 5 years, it took a bit of adjustment to have someone there all of the time. But, we adjusted to life together in our little one bedroom apartment. We learned to love together. We learned to disagree with each other. We learned to give up expectations and live for today. We learned to parent together. We grew together in our love of family and our love of God. And then, he was gone. I mourned the loss of my best friend, my husband, and my dreams for many years. I’ve never understood when I hear negative comments about marriage. I was told once after Terry died, that I was lucky I didn’t have to put up with a man any longer. (I definitely didn’t agree!) I’ve listened to comments about the “poor saps” that were getting married soon and how foolish they were. I couldn’t comprehend “out-growing” my husband and moving on to greener pastures. How do you out-grow someone with whom you are growing daily? Couples that lived very separate lives always mystified me. Terry and I had our own careers. And, we were sometimes separated due to traveling for work. But, I talked to him every night regardless of our locations. While I might enjoy a day or two of being able to “do my own thing”, I counted the days until we were both home together again. And, I think he did too. Anytime Terry and I were in the same room, people knew we were together. He was my husband and I was his wife. I wanted every person around us to know that. I was proud to be married to him. Life wasn’t easy. We struggled with finances and work options. There were extended family issues that affected our little family. In later years, there were health issues to consider. But, we had committed to God and to each other to see it through until the end. We were together! I married Tim in 2015. Being married in our 50’s is an experience. We both brought our own baggage into our marriage. We’ve endured the buying, remodeling and selling of a home, the buying and remodeling of another home, unemployment and the resulting financial problems, legal issues, the start-up our own business, joining a new church and just learning to be married to each other. We’ve both had to stop filtering every comment and action through our previous life experiences. I’m still working on my own insecurities and finding my place in our life together and with our children in this new family model. There are always challenges in blending families. Regardless of the age of the children in a blended family there are issues. Jealousy about who likes who better. Protectiveness of “my mom” or “my dad”. While we strive to build new family traditions, there is pain as the old traditions are changed or even replaced. Each child has different expectations for family life. There have been tears and complaints, hurt feelings and joy since our marriage. I expect that to continue as we grow together. I adore being married to Tim. At the same time, there are times that I still mourn for Terry and the things I miss sharing with him: our son, Zac’s wedding, the birth of Zac’s son, Gracie’s graduation from college and the purchase of her first home, etc. I also walk into unknown territory as a step-mom: Where do I fit? How involved is too involved? The joys far out-weigh the trials. Maybe because I’ve endured the loss of a husband, I truly treasure my time with Tim. My views haven’t really changed. I still believe marriage is for a life-time. I still believe that we are to “become one” in every way. There is no “out-growing” each other. I still believe in unconditional love. I believe I have been incredibly blessed to find such a deep and abiding love the 2nd time around. I still get butterflies when I hear his voice. I still count the days, the hours and the minutes when we are separated. To walk into a room holding my husband’s hand, is still one of the greatest thrills for me. I can find the happiness we all say we want, because of the joy and peace that I have in my marriage today. I am so glad I was given a chance at joy the second time around. I had a plan for today. But, the neighbors decided to have a yard sale, so mowing and edging and that unattractive sweaty stuff would have to wait. 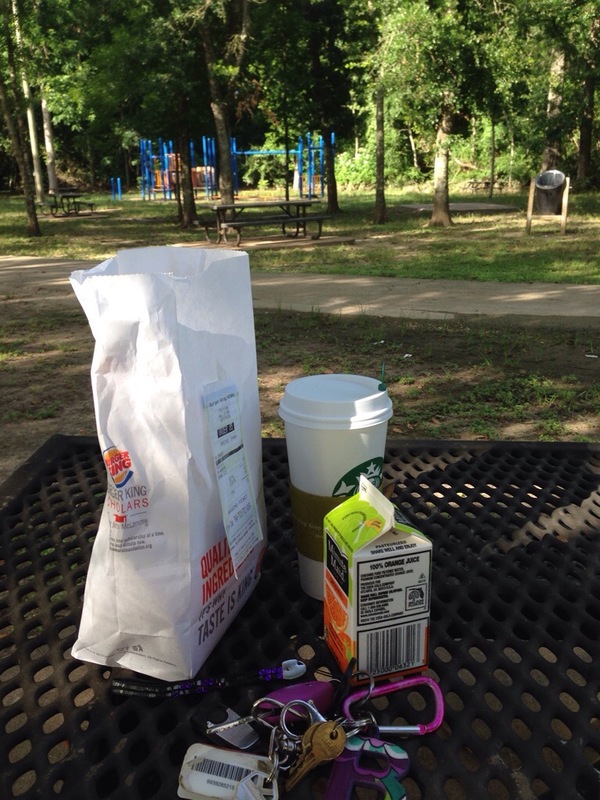 Instead, I got my coffee and breakfast and drove to a local park. I sat under the trees and listened to the birds sing. Memories flashed through my mind of my kids on this very play area. This was a favorite place for our family. I watched a squirrel searching the ground. I wished for my binoculars while trying to identify a little black and white bird. I hardly noticed when the tears started to roll. Tears for the great memories made here. Tears for the unknown that is yet to come. Tears for friends that are hurting right now, for the hurts that cannot be removed. Some days feel impossible, overwhelming. Plans are disrupted. Life is changed for now and forever. How do you keep going? Sometimes, it takes a moment in the park. Just remembering, taking the time to dream and trying to see hope in the distance. A new year. A new start. Well, sort of. It’s still the same life, the same job, the same issues. There’s nothing magic about January 1. But, it’s a starting point to think about changes. And a time to look back. I saw “The Secret Life of Walter Mitty” yesterday. It was a good movie. I left the theater thinking about the past: my kids past. In the movie, Walter’s life was altered by the death of his father. Dreams and adventures were set aside so he could be responsible. Through most of the movie I kept wondering what dreams my son pushed aside after his dad died. ‘what if’ and ‘if only’ moments. I can’t change the past. And worrying about it isn’t an option either. I’ve shed tears over what will never be. I hope and pray that, like Walter Mitty, Zac realizes his dreams and understands how important he is to the people around him. I dreamed about you. You were laughing and having so much fun. The jokes were as bad as ever. The laughter just as loud. It was so normal to be with you again. It was so vivid and real. And then it was morning. It took me a few minutes to decide what was dreaming and what was reality. I looked around to find you and be assured that you were real. I just wanted to be held and loved. You weren’t there. I only had your pictures and our memories. Since that night, it’s like losing you all over again. The sorrow has been so vivid and fresh. I can’t seem to move past the memories, past the yearning of my heart. I search for your face in the crowds. I look for you in the empty rooms of our home. I beg the phone to ring so I can hear your voice. But then, I remember that you’re dead and buried. For almost eight years, I’ve lived without your smile, without your laughter, without you. I won’t find you in the crowds and your voice is forever silent. I’ve learned to laugh again. I’ve learned what it means to live life fully without your love and assurances. But sometimes its just too hard. I miss you.